We are excited to have The Adams Experience returning for another summer of outdoor exploration and adventure! In collaboration with Fort Adams, The Adams Experience gives teens the chance to explore the beautiful National Historic Landmark through land and water. With days filled with swimming, kayaking, paddle boarding, and biking, this is an experience you won’t want to miss. Not to mention, enjoying lunch inside the fort and a semi private tour which includes the underground tunnels. Our well trained staff are eager to begin new adventures with you! Campers must be swim tested before signing up. At the Y’s Sports Camp, your child will be placed in an age appropriate group and take part in a variety of games, sports, and physical activity. The basic skills, rules and sportsmanship will be part of every day at camp. Fun games and new challenges will fill the morning while traditional camp activities such as rock climbing, archery and swimming will take place in the afternoon. The Y is partnering with Youth Island Lacrosse to provide campers the opportunity to build and practice lacrosse skills under the direction of strong, knowledgeable role models. This fun youth lacrosse skills camp is offered to youth boys and girls and designed to meet all skill levels. If you are new to the game of lacrosse or wish to increase your level of play, this is the camp for you! All Water Sports campers must be strong swimmers able to complete a 50 yard freestyle and be swim tested before signing up. Water Sports Camp provides an introduction and refinement to kayaking, boating, beach sport, surfing and other aquatic adventures. Campers will enjoy a wide variety of aquatic experiences at local beaches and programs at the Y that include the ropes course, gaga pit, pool and more. Counselors are all lifeguard certified and trained in the skills they are instructing. *See weekly newsletter for weekly camp locations. We are excited to be working in collaboration with RhodySquash and Newport Community Squash to offer this brand new camp this summer! Squash is a sport that can provide a lifetime of fun, friendship, and fitness. The session will introduce the beginning squash player to the proper grip, correct swing, footwork, and rules of the game. Campers will drill, run, play, and condition throughout the week. For more information visit our website at newportymca.org. Held at Newport Community Squash. Gymnastics camp is for boys and girls of all levels of gymnastics. Beginner through competitive! The gymnasts will be grouped according to level of ability and age. We ensure that your child has met all the basic skills before progressing to more challenging ones. Our day will include gymnastics rotations on the 4 women’s Olympic events, as well as traditional camp activities including swimming, rock climbing, arts & crafts and much more! Throughout the summer field trips will be offered. The Y is partnering with Gladding School of Dance to provide our youngest campers with a fun filled week of princess adventures. The week will include learning dances, playing with props, and creating crafts fit for a princess. We will have a royal ball in the morning at Gladding School of dance, and then return to the Y in the afternoon for more camp fun! The afternoon will include traditional camp activities including swimming, rock climbing, arts & crafts and much more! NEW this year NinjaZone is the coolest camp happening! Enroll your child today in our NinjaZone camp to experience the hottest sport sweeping the nation! At the end of the camp, your child will be ready to show off their “official sweet Ninja moves.” NinjaZone combines gymnastics, martial arts, obstacle training, and freestyle movement, while also focusing on building character. Your child’s confidence will soar, as they rise to challenges every day. Crafts, games, exercise, and FUN are found daily at NinjaZone camp! Your child will want to run, have fun, and burn off energy at home. Why not send them to NinjaZone camp, where they can redirect their energy into a truly positive focus?! Register today! Once you’ve registered, make sure to post a picture of your future Ninja to our Facebook page with the hashtag #NinjaZoneCamp! See you this summer! Camp “We Can!” is an inclusive setting for youth 5-21 years of age who require a smaller 1:4 ratio. Throughout the summer campers will build upon their communication skills, make new friends and receive the support they need to have a fun summer. The camper’s weeks will be filled with swimming, archery, rock climbing, arts and crafts, Wii, and exploring what Newport has to offer. Camp “We Can!” will be run in conjunction with other camps at the YMCA so campers will have the opportunity to integrate with other camps during specified activities. Buddy Camp is an inclusionary camp where campers with disabilities from grades 1 and up will be paired up for a week of fun and laughter that will last a lifetime. Each week with the support of their camp staff, campers will participate in camp activities where campers both with and without disabilities will learn to work together in each activity they attend. Campers in this camp should be able to remain with a group and require minimal one-on-one attention. Spots are limited, registration due June 1, 2019. For questions about our Inclusion Camps, please contact Cori O’Kane at 401-847-9200 ext. 117 or email corio@newportymca.org. Come experience an exciting week of rock climbing on the 40’, foursided climbing tower. Campers will also spend time on the high/low ropes adventure course with elements such as the vertical playpen, catwalk and more! Instructions from our certified team will include knot tying, belay commands, and basic climbing technique. This group will climb in the morning and spend time in the afternoon doing traditional camp activities such as archery, swimming, and field games! Bike Newport’s programs at The Big Blue Bike Barn will offer bikes, tools, instruction, group rides, and more. Bike riding and education will be complemented by community gardens, food growing, and hiking. Abutting Miantonomi Park provides direct access to all of the park’s rich landscape, trails, and history. The Big Blue Bike Barn offers opportunities to ride bikes and practice mechanical and safety skills. Participants learn how to ride and how to take care of their bikes — they practice safety, handling and maintenance. The Big Blue Bike Barn is poised to bring together bikes and gardens, food and food knowledge, skill-building for life and work, and collaborative use of public space. It’s an active, fun, healthy and inspiring destination for youth and families. Camp Happy Tails is for kids who love animals and who wish to learn more about them. This hands-on educational program allows campers to explore the Potter League and meet shelter animals. Activities include completing service projects, meeting shelter workers and guest speakers, making animal crafts and playing games. In addition, campers entering grades 2 and 3 will read humane themed books to Potter League “Reading Fur Fun” shelter animals. Parents may drop campers off at the shelter starting at 8:30 a.m. Camp program starts promptly at 9:00 a.m. At 12:00 noon campers will be transported to the YMCA where they will have lunch, participate in swimming, arts & crafts, rock climbing, high/low ropecourses, archery and field games. LEGO® Education for primary school students provide the engaging, hands-on experiences students need to explore core STEM concepts and link them to real-life phenomenon. Solutions grow with students as they problem-solve and discover how science, technology, engineering, and math affect their everyday life. Campers will be engaged in the LEGO® Curriculum from 9-12pm. Then they will eat lunch and engage in traditional camp activities, such as swimming and archery. Home economics, domestic science or home science is a field of study that deals with the relationship between individuals, families, communities, and the environment in which they live. This Camp will introduce children in grades 5-8th to food (where it comes from and how to cook it), textiles (sewing), finances, and social etiquette. Please join us in bringing the basics back to life and empowering our youth to be ready for all life has to offer. The Design, Build, Fly Camp offers campers a unique glimpse into the world of aviation. Throughout this week-long program, campers will build and fly their own remote-controlled aircraft, gaining valuable knowledge surrounding flight mechanics and aircraft design considerations in the process. Sean Dungan, an undergraduate studying Aerospace Engineering at Florida Institute of Technology, will guide the campers through their first scratch-built RC aircraft and will teach them how to fly their final product. For the first week we would like to do a “Creating with Fiber Art” program where kids will learn a bunch of fun basics of fiber arts such as weaving, finger knitting, hand sewing, and more! This would be for both morning and afternoon sessions. For the second week we would like to do a “All things 2D Design” program. Kids will learn more about 2 dimensional art through a variety of projects ranging from drawings, printmaking, painting, zine making, and other techniques! Children must be potty trained, no pull up diapers allowed. Dress for mess and artistic success! Young children are free to smear, squeeze, splatter, stomp, and otherwise explore new and engaging artistic possibilities. Children will work with a variety of materials in new, full-body ways sure to bring excitement and play to their artistic creations. Get ready for a messy good time! Let’s get our hands dirty! Did you know that using clay is a great way to increase your child’s fine motor skills and small muscle strength? This week, children will use clay and other materials to create 3-dimensional art beyond their wildest imaginations. Mold and maneuver all different types of art materials to create a gallery of sculptures. Masterpieces can be created with all sorts of materials! 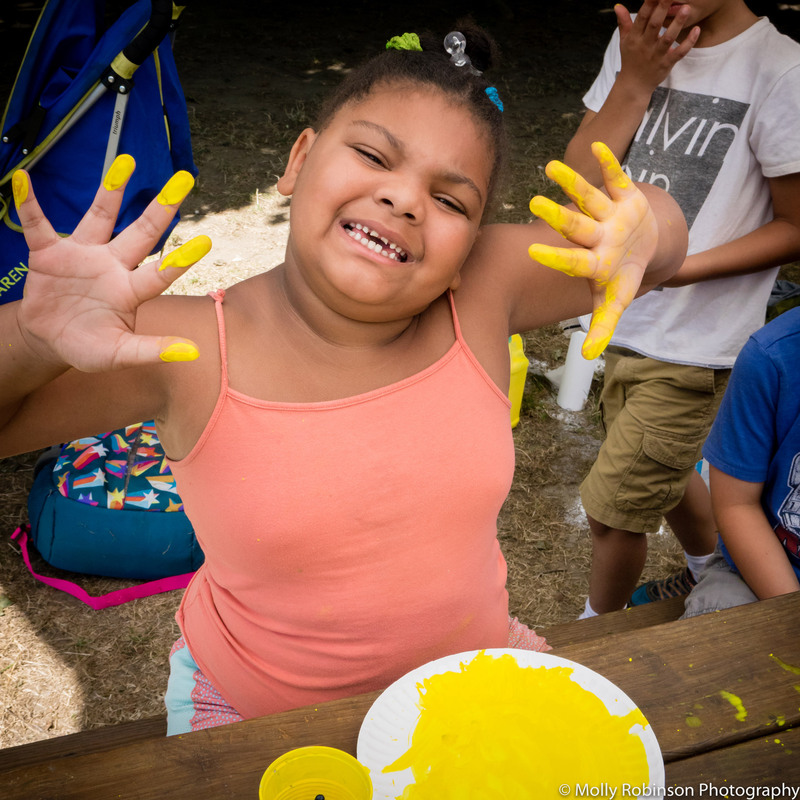 This week, the children will explore the use of many different resources – including those traditionally used in artistic endeavors (such as paintbrushes, colored pencils, safety scissors and more), and some more creative materials (sand, hard pasta, sandpaper…what else will we come up with?!) – to create one-of-a-kind work any child will be proud of! like, in the ways they like.